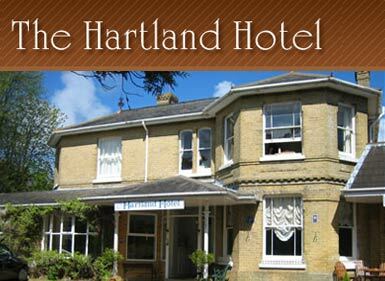 The Hartland Hotel is located in a beautiful tree lined avenue, close to Shanklin Old Village and its pretty thatched cottages. Within walking distance of Shanklin beach and the varied shops of the village where you can also find restaurants and pubs to cover all tastes. The hotel offers ample parking and pretty gardens.Stay fit at our in-house Health Club offering an indoor heated swimming pool, which is a good size for swimming lengths, a fully equipped gym, sauna, Jacuzzi and sun bed. FREE use of all Health Club facilities for all guests. Also, pamper yourself at our in house beauty and hair salon.We invite all our guests to enjoy at least one evening during their stay with a complimentary bottle of wine in our restaurant which offers an extensive menu for fine dining. All 22 bedrooms are en-suite. Why not stay in a room with a four poster bed or bring the young ones for a stay in one of our spacious family rooms? All Rooms have colour television, complimentary tea/coffee making facilities, direct dial telephones, wireless internet connection & a personal hair dryer.